The role of the new manager demands a new mindset, new activities, and new relationships with people throughout the organization. 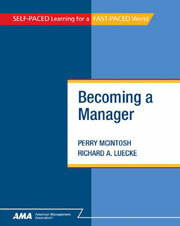 Becoming a Manager guides the first-time manager through these and other challenges. Part One, Making the Transition, explores how to make the critical shift from individual contributor to manager; what it takes to build a successful partnership with your boss; and the key elements of managing time, which is every manager’s scarcest commodity. Part Two, Developing Your Management Skills, examines how to use influence and persuasion to manage without formal authority; how to develop a leadership style; the elements of planning and setting goals; and the critical roles of work processes and continuous improvement. In Part Three, Managing Others, readers learn how to master the performance management process; adopt a process for making sound decisions; and handle difficult people and situations, including high-value customers or a difficult boss. Throughout the course, examples, exercises, Think About It sections, and topical sidebars provide readers opportunities for practice, feedback, and application. This is an ebook version of the AMA Self-Study course. If you want to take the course for credit you need to either purchase a hard copy of the course through amaselfstudy.org or purchase an online version of the course through www.flexstudy.com.